Never worry about your WordPress website again! From Design, security, backups, and updates. ThriveWP have you covered. The upkeep of your site is an important and vastly overlooked part of the everyday running of a WordPress driven site. Just as you expect with your vehicle engine, which requires timely changes of oil and tune-ups, website and software services require regular maintenance to function optimally. ThriveWP’s maintenance and management services are for business owners who value their time. By managing and maintaining all of the time-consuming aspects of your website, ThriveWP free up plenty of time for you to do what you do best – run your business. Imagine having your own WordPress help and support manager taking care of your website on a day to day basis. Ongoing Maintenance Services for WordPress. WordPress support involves more than just updating or developing a site. Websites also require other forms of regular maintenance such as backups, performance optimization, security audits, and updates. When you choose one of our plans you can sit back and relax knowing that everything is being taken care of. Your content will be updated as needed, core software will be updated and you will have WordPress support you can rely on. Keeping your Website in great shape. ThriveWP has years of experience with WordPress. From installation to hosting and maintenance, we have built many sites on WordPress, installed plugins, created custom themes and more. Most businesses just don’t have the time or knowledge of WordPress and just want their website to do what it should without worrying about making sure it is updated or that it has been backed up properly. ThriveWP is here to manage this for you 24/7 365 days of the year. Our services are inexpensive and they include quick fixes, plugin updates, backups, and many other tasks. We genuinely care about your website and will keep your site updated and backed up every day. Each Month you get real value from us through detailed customer reports. These tell you not only all the work ThriveWP does on your site each month but also provide additional information like keyword tracking details, security, and malware information and more. Having a total meltdown because you didn’t take a backup of your site! 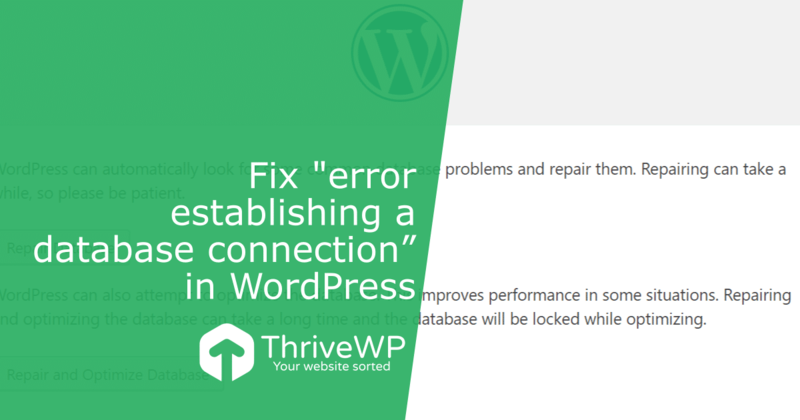 Need one off WordPress Fixes of help? Get in touch and we will see what we can do for you. Need content adding or changing? ThriveWP services include edit time each month. This can include small fixes or content changes. Simply send us your changes and ThriveWP will do the rest! The WordPress platform is very stable, but that should not mean that it is invisible. If your website is hacked or happens to go down for any reason, daily off-site backups will save you from the severe effects, which can necessitate the building of another website from scratch. Backups are hugely important and should never be overlooked. WordPress is a rapidly growing platform, developers are always adding new features and improving them regularly. When the core software is out-of-date, your website will gradually become less stable and secure and will not perform as you expect it to. That will cause poor user experience and negatively affect ranking on the major search engines. ThriveWP ensures your site is always up to date. WordPress does not take the security of websites lightly, however, as they strengthen the platform, malicious individuals will be looking for other effective ways to hack in. If you didn't know, Google will blacklist malware-infected websites. ThriveWP will ensure that your website is up to date and safeguard the reputation of your brand with monthly security audits and 24/7 security monitoring. The purpose of themes is to make your website look and function in a certain way. They do however still need updates to ensure they are compatible with the latest version of WordPress and fix bugs. Out of date themes will limit the security and performance of your website. We manage theme updates for you. The available plugins for WordPress will add more features on your site and improve its functionality. They will help you do various things such as creating forms and adding more visual effects. If an author updates a plugin, we will update it on your site to ensure that you are not missing the improved features and prevent malfunctions and problems on your website. Hi. My name is Gavin. I provide WordPress maintenance services, website creation, and design. I take care of all the technical stuff so you can focus on your business. Great website builder, was very patient and knowledgeable throughout. Great knowing I can add things to my site and any issues are resolved promptly. Highly recommend this service very happy with the finished product. Fantastic service. Very quick to respond to any inquiry. Made it very easy to go from no website to a great website. Gav gave all the advice needed and nothing was to much bother. First class service. Gav is a top chap, very helpful and his sites are functional and great value. Excellent service. Don't need help often but when I do any issues are sorted very quickly and with minimal hassle. Want your website looked after?